Metabolism refers to the process by which the human body generates and utilizes energy or calories for a variety of activities ranging from cellular absorption of nutrients to any physical activities, like running a mile for instance. Metabolism refers to the process by which the human body generates and utilizes energy or calories for a variety of activities ranging from cellular absorption of nutrients to any physical activities, like running a mile for instance. Some people are born with a faster metabolic rate as compared to others. The basal metabolic rate (BMR) refers to the average daily amount of energy utilized by the human body when it is at rest. Factors affecting a person’s BMR are height, age, heredity, and body composition. BMR is also called basal metabolic expenditure. BMR is used to maintain the body temperature and functioning of the heart, lungs, and other organs. Two-thirds of the calories one ingests are used up by BMR. Build muscle through activity or weight training. Metabolism has been shown to become slower as we age by as much as 2% per year. According to Shari Lieberman, author of the book “Dare to Lose,” muscle is the most important predictor of how well one metabolizes one’s food and how well one burns calories and body fat. In order to boost metabolism, one should take up strength training with dumbbells or resistance bands, at least two times per week. Even after the workout is complete, one’s metabolism speeds up for several hours. Eat 4-6 times a day. The human body is said to respond well to several small meals throughout the day. If we supply calories intermittently to the body, we can actually burn more calories because the body uses them up to digest the food. Eating many small meals also boosts concentration and energy. Exercise on a regular basis, even as little as 10 minutes at a time. One burns calories while exercising and even after exercising, for some time. Thus, any opportunity should be taken to indulge in (additional) activity, such as climbing the stairs or parking at the far end of the parking lot, so that one has to walk farther to the supermarket. Eat sufficient food to sustain one through the daily activities. According to Julie Beyer, a dietitian in Michigan, trying to lose weight by limiting one’s intake of calories actually causes a slowing down of one’s metabolism. Thus, one should eat enough to sustain the body throughout the day. Avoid consumption of sugar. According to Lieberman, one should primarily eat low-glycemic index foods. This helps keep one’s blood sugar levels stable. Eating sugary foods causes the body to store more fat. Do not skip breakfast. People who eat breakfast have been shown to be thinner than those who skip breakfast. Vegetables and brown rice can be a good breakfast choice. Eat hot foods. Lieberman mentions that hot, spicy foods have the effect of revving up one’s metabolism rates. Drink green tea. The consumption of green tea has been said to boost metabolism for a longer period of time. According to a study published in the International Journal of Clinical and Experimental Medicine in 2014, green tea extracts reduce adipogenesis (a process of cell differentiation). By taking these steps to promote metabolism, there are two health benefits – one can burn calories before they are stored as body fat and any additional existing body fat may also be burned. O'dea, K. (1984). Marked improvement in carbohydrate and lipid metabolism in diabetic Australian Aborigines after temporary reversion to traditional lifestyle.Diabetes, 33(6), 596-603. Yang X, Yin L, Li T, Chen Z. Green tea extracts reduce adipogenesis by decreasing expression of transcription factors C/EBPα and PPARγ. Int J Clin Exp Med. 2014 Dec 15;7(12):4906-14. eCollection 2014. PubMed PMID: 25663987; PubMed Central PMCID: PMC4307434. Center, G. H. (2008). 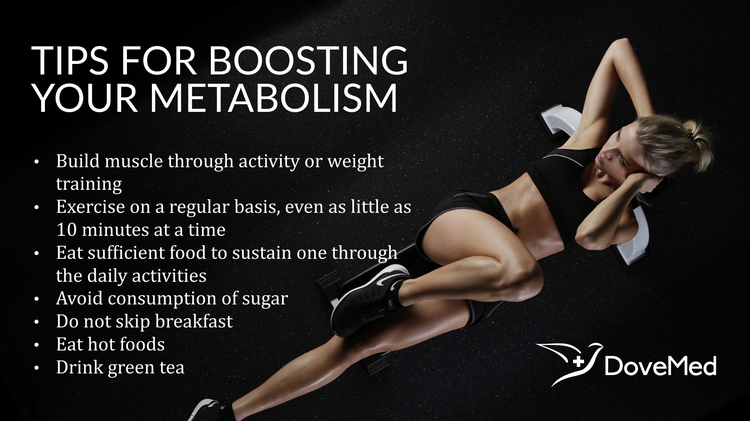 Natural tips for boosting your metabolism. Berman, R. (2013). Boosting Your Metabolism for Dummies. John Wiley & Sons. Ukra, M., & Kolberg, S. (2008). The Ultimate Tea Diet: How Tea Can Boost Your Metabolism, Shrink Your Appetite, and Kick-start Remarkable Weight Loss. Collins. Hyman, M. (2009). The ultrasimple diet: Kick-start your metabolism and safely lose up to 10 pounds in 7 days. Simon and Schuster. Paulún, F. (2013). 50 Ways to Boost Your Metabolism: How Mustard, Red Wine, and Days at the Beach Can Help You Lose Weight & Stay Healthy. Skyhorse Publishing, Inc..